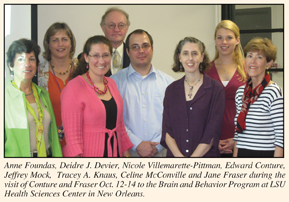 Neurobiology of Stuttering: Are There Distinct Subtypes? The exact cause of stuttering is likely to be complex and may be multifactorial. One potential mechanism relates to a defective speech monitoring system. The basic theory is that ongoing sequential and fluent speech output is dependent on auditory sensory feedback, which monitors and corrects errors online. In normally fluent individuals, a dysfluency would be detected as an “error”, and this error would be automatically corrected on-line via auditory self-monitoring. Stuttering behaviors, such as involuntary repetitions, blocks, or prolongations in the utterance of speech elements, may be induced by disrupted auditory self-monitoring within a closed-loop system. Thus, stuttering can be modeled, as the result of disturbed auditory feedback. In 2001, we found that the planum temporale (PT), a brain region important in auditory processing, was anatomically atypical in adults with persistent developmental stuttering (PDS). However, the association of atypical PT anatomy to atypical function was not directly examined in this study. Therefore, in another study we attempted to determine whether there was a relationship between fluency and the anatomy of the PT under conditions of altered auditory feedback (AAF) and non-altered auditory feedback (NAF). Two groups were identified. One group had a larger left PT (leftward PT asymmetry) and one group had a larger right PT (rightward asymmetry). The PDS subgroup with atypical rightward PT asymmetry was significantly more dysfluent at baseline than the PDS subgroup with typical PT anatomy. These groups differed in their response to AAF. The individuals with atypical PT anatomy became more fluent under conditions of AAF. The individuals with typical PT asymmetry did not become more fluent with AAF. The subgroup that we identified with atypical PT anatomy may represent a distinct biological subgroup. In 2001, the SpeechEasy device was developed to treat stuttering by using principles of AAF. It is a small device which looks and fits like a hearing aid. This device works in essence by “playing a copy” of the person’s own speech in their ear after shifting the pitch as well as creating a temporal delay in the acoustic output of their speech production. According to the manufacturers development and testing of this device and empirical studies, there are some individuals that have a marked improvement in speech output with use of the device and these effects persist over time. Some people who show improvement initially may have diminished benefit over time. There are other individuals that may not respond to the device with a significant improvement in speech output. We are interested in determining whether there are predictable brain-based measures of auditory temporal cortical anatomy and function that are associated with a better treatment outcome. It may be that atypical PT anatomy will be associated with a better treatment response to AAF, and bilateral deactivation of auditory temporal cortex may be “corrected” with treatment, i.e., this pattern may become more left lateralized as reported in fluent controls. In order to understand the mechanism of action of this device we have examined the device under laboratory conditions. To date 20 participants — 11 adults who stutter-AWS, 9 controls — have been examined. At the recent ASHA meeting in New Orleans, we reported on the results in the right-handed men evaluated to date including AWS (n=8) and controls (n=8) matched on age and education. The results in our larger sample confirm what we found in our preliminary analyses. The device has more influence on stuttering frequency during narration and reading than during conversational speech. This effect interacts with which ear the device is worn on. That is, some participants had more effect with the device in the left versus the right ear. As has been shown with previous studies, there was considerable variation among participants. Thus, our preliminary results show that the AAF device can influence stuttering, but inconsistently with a great deal of individual variation. It is important to determine whether specific settings, ear placement, attention or other biological factors, like the anatomy of the PT, may influence response. Armson J, Kiefte M, Mason J, De Croos D. (2006) The effect of SpeechEasy on stuttering frequency in laboratory conditions. J Fluency Disord. 31:137-152. Foundas AL, Bollich AM, Corey D, Hurley M, Heilman K (2001). Anomalous anatomy of speech-language areas in adults with persistent developmental stuttering. Neurology, 57: 207-215. Foundas AL, Bollich AM, Feldman J, Corey DM, Hurley M, Heilman KM. (2004) Atypical planum temporale anatomy in stuttering: Relationship to delayed auditory feedback. Neurology. 63: 1640-1646. Kalinowski, J. (2003). Self-reported efficacy of an all in-the-ear-canal prosthetic device to inhibit stuttering during one hundred hours of university teaching. Disability and Rehabilitation, 25: 107–111. Pollard, R, Ellis, JB, Finan, D, Ramig, PR. (2009) Effects of the SpeechEasy on objective and perceived aspects of stuttering: A 6-month , Phase I Clinical Trial in naturalistic environments. J of Speech & Hearing Research. 52:516-533.